Dwarf Meyer lemon bush (trees) are perfect for tiny gardens! Who says you need massive land space to grow an orchard of citrus? Not in my garden world! I have 7 dwarf Meyer Lemon (Improved) bushes flourishing and fruiting in two small garden beds. You should see the size of the fruit! The scent and the taste are surprisingly full-flavored coming from such a small plant. And the naches it inspires in me when I can say, “I’m going to the garden to pick a fresh lemon” is like nothing else….except for maybe when my kids do something clever. The naturally mounding bush can be maintained as short as three feet tall without compromising fruit production. If you have a patio or balcony and want just one citrus tree, I recommend this one. The Meyer lemon is evergreen and bears fruit in my zone 10 garden practically year round. Planting zones south of mine usually do well with this citrus tree because it does not require extremely hot temperatures to fruit, as it is sour fruit. That said, the dwarf Meyer Lemon tree should be overwintered indoors or in a protected area if you live in “snow country” or areas susceptible to frost. The Meyer lemon is much sweeter than other lemons such as the Eureka or Lisbon and the peel ripens to warm burnt ocher, almost orange color. The first time I squeezed a Meyer lemon, it practically fell apart. The peel is thin and the fruit has only a few seeds. Juice spring forth with the slightest squeeze. I was tempted to take a piece of the peel and chew on it, but I passed. I’ll have to try a candied peel recipe sometime. I’ve heard that the thin peel makes the candy especially delicious! So, what does my precious little lemon tree need to stay in top form, keep the fruit coming and make me happy? Citrus trees in my sunny, mild Southern California climate require a good dose of nitrogen and micronutrients like iron, zinc, and manganese. I usually apply an organic fertilizer blend like Dr. Earth’s Organic Fruit Tree Fertilizer, to make feeding “no brainer ” practice. As far as watering is concerned, I keep it moist, but not soggy and never allow it to dry out during the growing season. Soggy and overly dry conditions invite pests and disease. Oh, the joy of dwarf fruit trees! 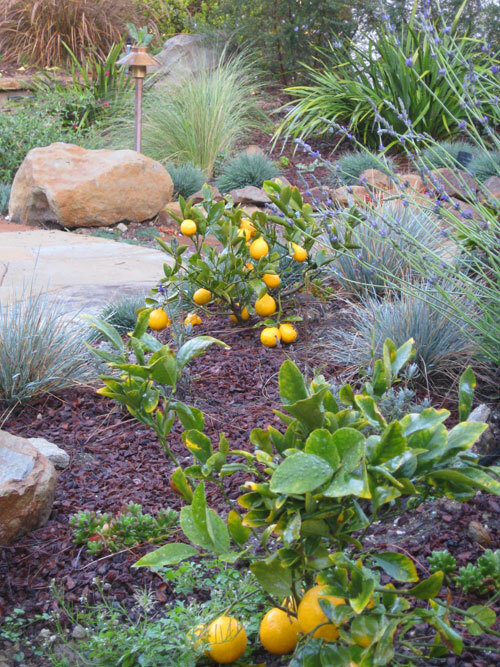 Make some space for these dwarf Meyer lemons in your yard. I’ll have to tell you about my other dwarf fruit trees sometimes. My garden is a “walk and eat” kind of place….just like an Eden should be. Take a look at this “edible front yard landscape” Michael Glassman and I designed for our show, Garden Police on the Discovery Home Channel. When a citrus tree is under a lot of stress it can drop more fruit than is normal. 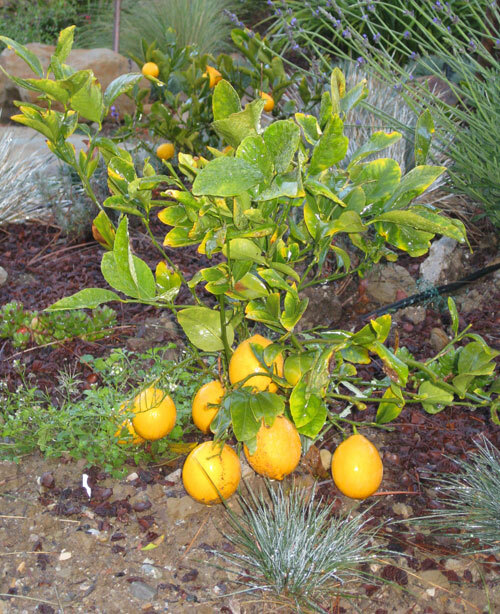 Meyer lemon trees can “self thin” by nature but too many fruits dropping can be from a variety of reasons. You may be overwatering. How long does the sprinklers stay on 2x per week? Do you have good drainage? Are you fertilizing with citrus tree fertilizer during the growing season? Hi…Our recently planted (2 months) Meyer Lemon "Bush" in Central FL is blooming like crazy, and fruiting, but won't hold the fruit longer than a few days. It is in the ground, in a bed that is watered with sprinklers (2X weekly), and drainage is very good. We had a Meyer lemon tree at our last location, and supplied fruit for the neighbors every year. Any ideas about the ongoing fruit drop? Thank you. Dwarf Meyer lemons will grow in Arizona. The prime challenge for these citrus trees is with cold weather, not hot temperatures! will dwarf meyer lemon bush grow well in arizona’s heat? HI Phil. Welcome to Eden Makers! You apparently have great success with your citrus trees! You harvested a truck load of fruit? That is amazing. I like your idea of sharing with the neighbors- a good tip to steal. Thanks for commenting and for your insight. Hi Garden Mad- welcome to EdenMakers! If the lemon trees you have are not cramped in the present pot, I see no reason to change pots. keep in mind that dwarf varieties are slower growing than the regular sized trees. If your trees are not dwarfs, you may have to repot every couple of years or so, depending on the growth rate of the trees. I always used dwarf citrus trees in pots. If I start with a 15 gallon tree, I pot in a 24″ container and it will stay there for at least 4 to 5 years. As soil levels decrease due to settling, check the condition of your roots. You will be able to tell if they are starting to push the edges of the pot or not. If so, move it to a larger size. Good luck and enjoy your fruit. I recently was given two lemon trees by my son (for mothers day, ahh). They seem to be happy and there are fruits but I am tempted to repot them; how often do they need repotting? Do they fruit year round? I am a longtime user of dwarf citrus in the landscape. 30 years ago I planted two Tangerines (Mandrins), one OrlandoTangelo in front of my house. Yields vary from year to year. These citrus get half day sun and ripen later than full sun grown trees. Just this past March and April, my grandson and I harvested more than a PICKUP truckload of fruit from these trees. Best Yield ever. Everyone in the neighborhood got bags of fruit delivered to their front porch. We live in a cool coastal area of So Cal. The only pest control is tap water sprayed to wash off any insect buildup. Ladybugs, Lacewings, Spiders frequent the citrus keeping pests under control. Citrus fruits store best left on the tree and picked as needed. The sweetness improves with time and with heat. Trey, what are your planting zones? USDA map? Sunset? Susan at GardenRant is looking for regional gurus and your services may be needed. Go over there right now and sign up= that’s an order! opps, that’s Satsuma not Stasuma. They are also called “zipper skin” since the peel comes off in one fell swoop. Big mandarin country in the lower foothills, below Auburn. Newcastle has a Mandarin festival each year. We sell all dwarf citrus so they can be put in containers and moved to a protected spot during winter. The Meyer lemon is one of the most cold hardy citrus and as such a good one for our colder winter region in the foothills. The Washington navel and Stasuma mandarin is also quite cold hardy. None are recommended for planting in the ground here. Citrus make such great ornamental subjects with the bright green leaves and powerful, intoxicating aroma. Add that to the fruit they provide and the hardier citrus make great container subjects even here in the lower Sierra.